With talent demand high and supply low, your organization can’t afford to make hiring mistakes. A quick Google search pulls up a bounty of articles on hiring mistakes and how to avoid them. In this blog, I am sharing five common hiring mistakes and tips for avoiding them—all based on APQC benchmarking and best practices research that you can trust. APQC members can find more trusted guidance in APQC’s Knowledge Base including a summary of recruiting best practices and overview of key recruiting benchmarks. Too often, the hiring process begins when a requisition to fill an open position is submitted. The immediate need for a new hire limits time to explore sources of candidates and to identify the best-fit candidate for the position. How to Avoid This Mistake: A better approach is for HR and business leaders to meet at least yearly to anticipate future hiring needs and brainstorm candidate sources. Next, recruiters and employees foster connections with these sources and candidates. When a position opens, the recruiter already has a pool of promising candidates to reach out to. Reactive approaches drive many employers to prioritize hiring speed over finding the highest quality hires. Yet, it is essential that employers seek to balance these two objectives. An ill-fitting hire reduces productivity and often results in premature departure and the need to start the hiring process anew. How to Avoid This Mistake: Recruiters can strike a balance by educating hiring managers on the effects of making decisions based on a need for speed versus quality. When a hiring manager pushes for speed, the recruiter should resist by explaining how the speed-quality trade-off would affect performance for the hiring manager and his or her team. Job requirements have become hiring manager wish lists—documenting the highest levels of education, experience, and skill needed to perform a role. These lofty rather than practical criteria narrow the candidate pool and increase the risk that the new hire will be overqualified, grow dissatisfied, and leave the position prematurely. How to Avoid This Mistake: An alternative is to craft job requirements that reflect the minimum capabilities needed to learn a role over time and to take into account which capabilities are realistically available. To create such a list, the recruiter and hiring manager need to have frank conversations about which capabilities are truly required to do the job and how much the hiring manager and organization are willing to “pay” to secure them. The emergence of technologies that automate hiring has focused attention on the transactional aspects of the hiring process. However, making a successful match and securing offer acceptance also requires a focus on relationships in hiring. How to Avoid This Mistake: Recruiters need to establish relationships with hiring managers so they can fully understand hiring managers’ expectations for the hiring process and job candidates. Recruiters also need to foster relationships between candidates and hiring managers as well as between candidates and potential co-workers. These relationships help both the candidate and employer assess fit. When formed as part of a proactive hiring process, they can speed, rather than slow down, the time required to make a quality hire. The first instinct of recruiters and hiring managers is frequently to look outside the organization for candidates to fill open positions. It is also common to look at the same sources and seek the same types of candidates year after year. 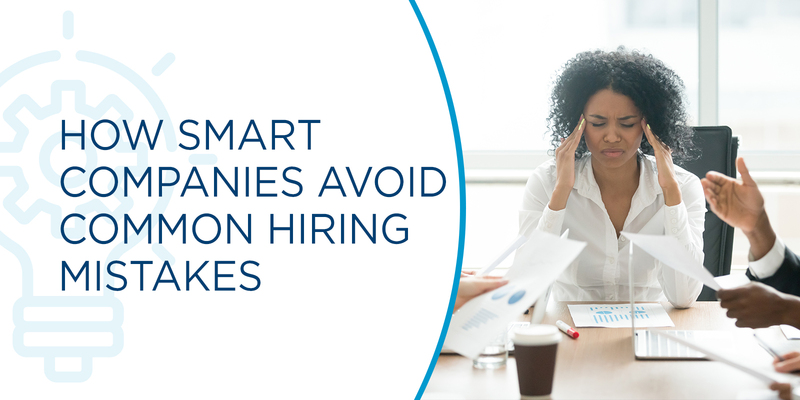 These practices can make it harder to find a match, add time to the hiring process, and lead the employer to miss the best candidates. How to Avoid This Mistake: To encourage the use of internal candidates, HR should inventory workforce capabilities and have employees keep this inventory current. Both HR and managers should seek out and support internal talent moves. To further expand the candidate pool, recruiters need to think broadly and creatively regarding potential sources of candidates. Both HR and managers should be open to different types of employees such as contract, part-time, job-share, and remote workers. What hiring mistakes affect your work? How does your organization keep from making hiring mistakes? Comment to share your experiences. Or reach out via Twitter @ElissaTucker or LinkedIn www.linkedin.com/in/elissatucker.